Other World Computing unveiled a pair of RAID offerings at Macworld Expo this week—the Mercury Elite-AL Pro and Mercury Rack Pro. The former is a dual-bay quad-interface RAID storage device, while the latter is a four-bay, quad-interface rack mount product. Users who want transfer speed and storage for performance-intensive applications such as A/V, digital photography, music and graphics can choose between the seven pre-configured models of the Elite-AL and the six pre-configured Rack Pro models. Greater capacity (up to 6.0TB), fast performance and configurability are achieved with multiple SATA drives with either mirroring or striping RAID modes. A quad interface allows for USB 2.0, Firewire 400/800 and eSATA connections to make use of RAID-0 performance. 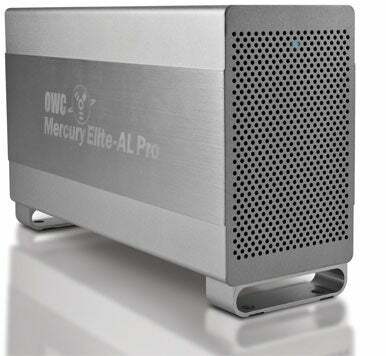 The Elite-AL models feature RAID-0 and start at 500GB for $220; they top out at 3TB for $500. The Mercury Rack Pro starts at 2TB, priced at $900, and goes up to 6TB, priced at $1,300. It offers capacity for four drives and features both mirrored and striped RAID functionality (RAID 0,1,5,10). You’ll find a complete list of models, pricing and system specs at Other World Computing.